This peak is #9 on the Height List for Alaska . 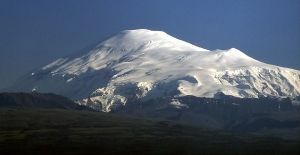 This peak is #16 in Prominence List for Alaska .Mount Sanford is a huge massif located in Alaska's Wrangell Mountains. A broad icefield covers the summit and the mountain has a wicked south face. The north slopes is the standard summit route, which can be done as a ski ascent. Name Notes: Named by Lt. Henry T. Allen in 1885 for his great grandfather, Rueben Sanford.